As Chairperson of the International Coordinating Committee of the International League of Peoples’ Struggle, I thank wholeheartedly the ILPS ASPAC and all the ILPS Chapters in the Philippines, Indonesia, Australia and Hong Kong for organizing this solidarity conference and availing of the ILPS Philippines as the host organization. I happily welcome all the participants from the ILPS chapters in the Asia-Pacific region and the US, all the allies from progressive organizations in the Pacific, Northeast, Southeast, South, Western and Central Asia and all those who participated earlier in the ILPS Conference on War and Militarism in Toronto. Your solidarity conference is held this November in conjunction with the Leaders’ Summit of the Member States of the Association of South East Asian Nations (ASEAN) and the East Asia Leaders´ Summit which includes representatives of leading imperialist and capitalist powers, namely the United States, the European Union, Russia, China, Canada, Japan, Australia, and New Zealand. These are the culminating meetings of the ASEAN that are held in the Philippines as this year´s chair of the ASEAN. Both the ASEAN and the EAS summits occur at a time of rising tensions in the region due to intensifying competition between US and China for spheres of influence and due to the shift to a multipolar world order amidst a protracted global depression. US imperialism is hell-bent on stopping its strategic decline and preserving global hegemony, especially in the Asia-Pacific, against the rise of Chinese monopoly capitalism and other rivals such as Russia and their allies. Still pursuing a multi-pronged Pivot to Asia policy, the US is escalating militarization in the Asia-Pacific and raising the risk of open military confrontation and war that imperils peace and the future of the peoples of Asia and in other areas. US military presence in the region is further expanding and consolidating in the face of resistance by rival states, by states assertive of national independence or by revolutionary movements for national and social liberation. The US engages in war provocations against the Democratic People’s Republic of Korea’s (DPRK) assertion and exercise of national sovereignty and the right to national defense. Together with south Korea and Japan, it has sought to discredit the DPRK for nuclear and missile testing, and has heightened the tension in the Korea Peninsula. Philippine President Rodrigo Duterte has exposed himself as a rabid running dog of US Imperialism. Like his predecessors in power, he has kept in place the unjust, anti-people and unequal treaties with the US like the Visiting Forces Agreement (VFA), Enhanced Defense Cooperation Agreement (EDCA), and the neoliberal economic policies imposed by Washington to name a few. These remain active and are being enforced. At the same time, he continues to yield to China’s military encroachment of the West Philippine Sea. I urge you to carry on the momentum of the August 2017 ILPS-led Conference on War and Militarism that gathered anti-war forces around the world and united the participating organizations in heightening the campaign to resist the US-led war, US military bases, militarism and fascism. The current conference should be able to mobilize larger forces and accumulate greater strength for advancing the struggle. I am confident that the current November meetings can raise to a new and higher level the people’s global resistance against the imperialist economic, political and military agenda. Anti-imperialist solidarity against the US-led war militarism can be expanded and consolidated. 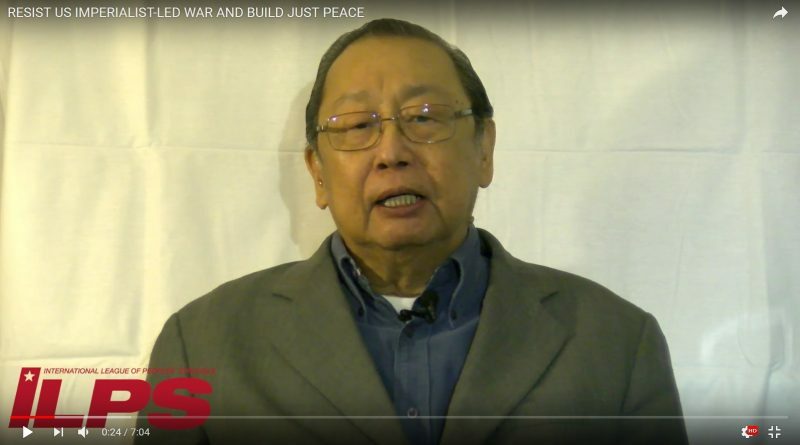 The political issues that need to be be tackled and the actions that need to be conducted serve to prod all of of us to raise the campaign to resist the US-led war and US Military Bases to a new height as we further strengthen the ILPS in the Asia-Pacific region and relaunch the Ban the Bases network. 4. To launch ILPS Asia Pacific and expand and consolidate its chapters, allies and potential members on the analysis of the imperialist agenda, policies and actions in Asia and the Pacific. ← People in Asia-Pacific resist Trump’s visit to the region!